I love the movie "The Miracle Worker", but I didnt always love it. It used to be just another annoying movie that I was forced to watch probably hundreds of times in school. 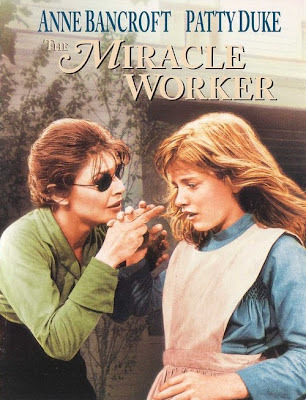 Every time I had a substitute teacher, they would reach for "The Miracle Worker" VHS and I would watch this movie with boredom yet again. It wasnt until I started working in the field of ABA that I started to appreciate this movie. I watched this movie as an adult after I had started working with children with Autism, and it was like seeing the movie for the first time. I saw every great ABA therapist I had ever worked with reflected in Anne Sullivan. Theres great parallels between this movie and what a great ABA therapist (or a great teacher) does. In a sense, we pull children kicking and screaming -sometimes literally- out of the enclosed world of Autism and into the world of ABA... Sometimes we have to pull family members and teachers kicking and screaming too. We pull these children into eye contact, conversation, affection, and cooperative play, and out of averting their eyes, walking away from peers, tantrums, and self harming behavior. Its tough work that requires thick skin, and being able to be firm when everyone else wants to give in. It requires repetition, persistence, a mountain of patience, and optimism. When even the people closest to the child are telling you, "don't bother", "he wont learn that", "you're wasting your time", a great ABA therapist continues trying, and continues teaching. Anne Sullivan: Mrs. Keller, I don't think Helen's greatest handicap is deafness or blindness. I think it's your love and pity. All these years you've felt so sorry for her you've kept her like a pet. Well, even a dog you housebreak. James Keller: Sooner or later, we all give up, don't we? Anne Sullivan: Maybe you all do, but it's my idea of the original sin. Anne Sullivan: It's less trouble to feel sorry for her than it is to teach her anything better. Anne Sullivan: Pity for this tyrant? Is there anything she wants she doesn't get? I'll tell you what I pity... that the sun won't rise and set for her all her life, and every day you're telling her it will. What you and your pity do will destroy her, Captain Keller. Anne Sullivan: [after a breakthrough with Helen] Now all I have to teach you is one word - everything.